New Report: The ROI Of Agile Customer Care: Reduce Training and Easy To Add Channels | Constellation Research Inc. The word “agile” has been part of may conversations when it comes to software. 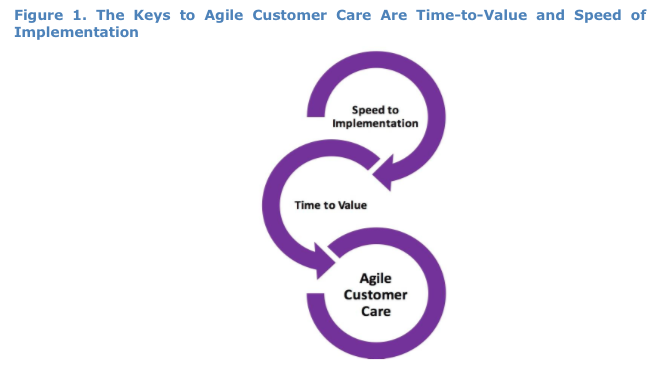 This new report looks at the importance of agile customer care. 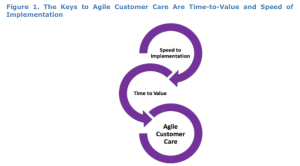 What exactly does agile customer care and agile customer experience mean? The costs for customer service, customer care or customer experience often come in when a company wants to add a channel, say email or chat or mobile. Often times, depending on the technology stack they already have, there is a lot of code that has been written to add something new – i.e., it requires that a major pow wow of IT, customer care, business leaders, etc.. to all get in a room and meet and discuss the benefits, risks and timeline of adding a new channel. that timeline could be weeks or months. Often adding that new channel means that the code that has already be written in the customer service software has to be adjusted. This often means IT has to get involved and this change to the code needs to be added to IT’s agenda of an already long list of “asks” from the business as well as what IT is already tasked with (maintenance, system upgrades, compliance, security, etc…) Perhaps we are unrealistic and have always been unrealistic to expect that IT can and should handle everything IT specific as well as all of the needs of the business. Maybe IT should be split into two different departments, one focused on purely IT issues and the other being the IT business liaison? So agile customer care or customer experience software allows a company to add a channel very easily without affecting the code or requiring months and months of writing new code so the addition to the system doesn’t mess up what is already there. In addition, when agile customer care is implemented, it is often so simple that customer service agents don’t need training. The use of the software is very intuitive. Agents are one, if not the most expensive re-occuring expense in a contact center. So anything that can reduce costs associated with customer service agents (without negatively affecting the service they provide) is extremely important. It’s also important to look at the stress put on agents to learn new technology. Generally agile technology is more easily adapted because it is so much easy to use. Blame it on the consumerization of IT (CoIT) if you want, but people expect the technology they use to get their job done to be as easy as using a search engine like Google or Bing. (They forget that those types of softwares only have one function – to be a search engine and the software we use to service customers is far more complicated… Nonetheless, people still expect easy to use GUI interfaces that are intuitive. That you’ll only find in agile software. It was designed with the user in mind! MY POV: Choose agile first. A company can’t be agile if the systems, infrastructure and technology it is using are not agile – meaning that they can’t be changed, added to or modified quickly, on the fly, without waiting in line for the IT department. IT should be supporting the business, customer care and customer experience by choosing agile solutions that allow for quick additions of new channels, workflows, fields and features. Agile should be part of the strategy, part of the process, part of the technology, and part of the culture. Design customer service into the customer experience, making sure that the complete customer journey includes an exceedingly better customer service experience. Because customer service needs to happen right where the customer is, it is key to use embeddable customer service tools, especially when it comes to mobile customer care. The key is to make the service experience more effortless. All customer conversations (social, chat, email, messenger, Facebook, Twitter) should funnel into one place so nothing or no one is left behind. Help customers help themselves by providing amazing, agile self-service capabilities, with one customer portal and knowledge management base. For more information you can download a courtesy copy of the report here.